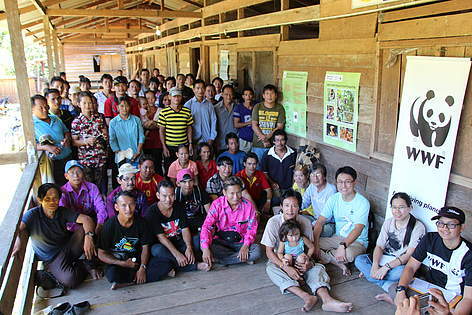 A consultation session held with the Penans in Kubaan Puak, Sarawak, on their participation in a Community Representative Committee, which enables community members to share their input and concerns on forestry activities in the area. Local communities and indigenous peoples are the world’s oldest conservationists. They use traditional knowledge and ancient wisdom passed down over generations to manage natural resources in a sustainable way, leaving minimal impact on the environment. They have a close bond with nature as their lives and livelihoods depend on rainforests, rivers and oceans, and the various species of plants and animals that call these ecosystems home. Living in or around areas of high biodiversity, local and indigenous communities are the natural guardians of the environment. WWF-Malaysia’s Community Engagement and Education (CEE) Programme focuses on working with rural and indigenous communities as key partners who play an important role in protecting and conserving the environment. CEE activities are integrated into conservation projects in Setiu, Melaka, Northern Banjaran Titiwangsa, Sarawak and Sabah highlands, Kudat and Semporna. These include training and capacity building, supporting sustainable livelihoods, conducting outreach and awareness campaigns, participation in patrolling and monitoring activities, empowerment through community platforms and organisations, and involvement in planning and decision making processes. CEE approaches are implemented in line with the provisions on rural communities and indigenous peoples, contained in international instruments such as United Nations Declaration on the Rights of Indigenous Peoples (UNDRIP), ILO Convention 169 (Convention Concerning Indigenous and Tribal Peoples in Independent Countries), Convention on Biological Diversity (CBD) and the Access and Benefit Sharing Protocol (Secretariat of CBD, 2011). Through supporting communities’ participation and ownership over natural resource management, CEE aims to develop socially responsible conservation programming which enhances well-being and reduces poverty among communities, and encourage collaborative management while safeguarding the rights of communities and their access to resources. The ultimate goal is to drive more inclusive, equitable and sustainable conservation. Find out more about WWF’s global work on people and conservation here.